La Joya ISD students participate in a underwater robotics competition Jan. 26. The Academy of Health Science Professions-STEM held the inaugural ROV-A-CON, an underwater robotics competition, Jan. 26 at La Joya ISD’s new natatorium. 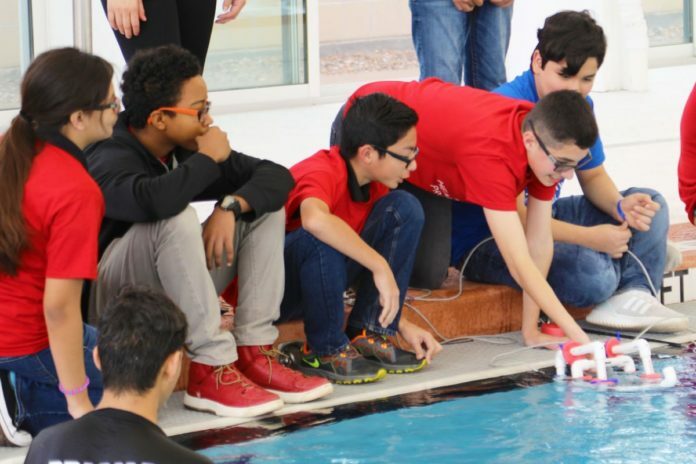 Students from several middle schools were invited to compete in the event, which implements the use of remotely operated vehicles (ROV), and put their STEM and communication skills to the test by navigating their ROV through hoops underwater. Each team was allowed three trials and the team with the lowest averaged time would be declared the winner. ROV-A-CON came to life thanks to three organizations from the Academy of Health Science Professions-STEM: robotics club, engineering club and National Honor Society. These organizations, combined with the assistance of teachers and sponsors, helped expose middle school students from La Joya ISD to a fraction of what the STEM field has to offer. Ramon Menchaca, a science department teacher from the Academy, explained that students had to gauge their knowledge in science, technology, engineering and mathematics, but, more importantly, their communication skills to be successful in this competition. The Academy of Health Science Professions-STEM opened this competition to the eight LJISD middle schools at no cost, and provided meals and transportation in hopes of enticing middle school students to get involved in the STEM field.